Hi guys am back after a month long vacation in India, I had a fantastic time. I met my niece for the first time and fell utterly in love with her, she is just about the cutest baby on Earth, of that I am convinced. One month flew without me knowing it. While it is good to be home, back in Qatar, with my husband, I miss my niece, so much … Tessa this giant kiss goes out to you… I love you so very much. Today’s recipe is a healthy and simple one. 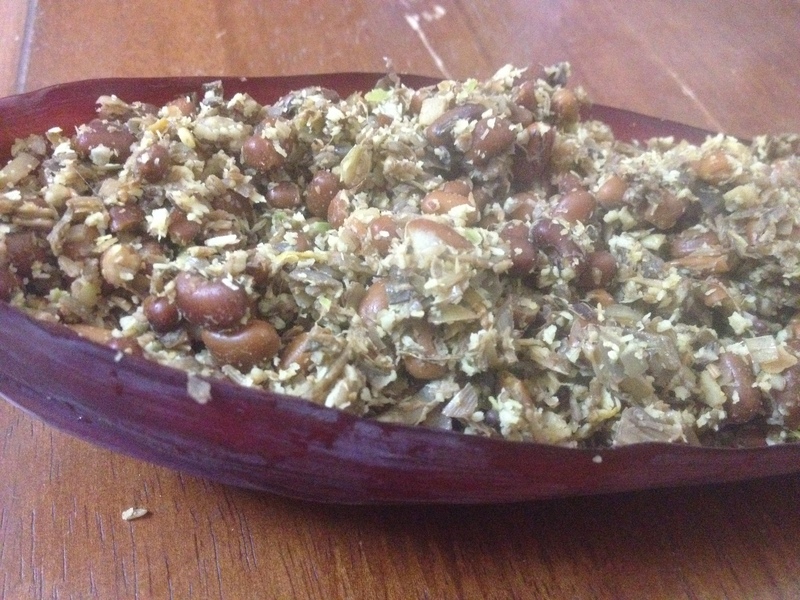 It is made from Banana flower or vazhachundu along with red gram. A lunch time favourite and a staple at my home. Vazhachundu is an amazingly healthy vegetable and you can read more about its health benefits here . Cleaning it is a bit of trouble , to learn how to do that read this post. Coarsely grind the coconut with cumin seeds, green chillies, garlic cloves and curry leaves. Heat oil in a pan, add mustard seeds, Shallots, curry leaves and sauté well. Add the ground coconut and sauté for a bit. Add the chundu, red gram, salt to the coconut , mix well and cover and cook till done (4-5 minutes). Soak the tamarind in 1 cup water for 10 minutes. Extract juice and discard the pulp. Pressure cook dal and washed taro root for two wistles. Remove Taro root after pressure has gone down, peel, and slice into fingers. Mash the dal to a smooth consistency. Heat ghee in a kadai and add the ingerdients of the masala paste and fry over low heat till fragrant. Grind to paste using as little water as possible. To the same frying pan add the tamarind water, turmeric powder, and salt and bring to boil. After it comes to a boil simmer and let it cook for about 10 minutes so the raw smell of tamarind may go. Add the dal, taro root and masala paste and simmer for about 5 mins till thick. For the tadka heat ghee in a pan add the tadka ingreients and wait till it splutters itself out. Add the tadka to the curry. Serve hot with rice. Not too bad huh …easy right. With a little pre – preparation it can be a downright fast meal. Anyways……… during my weekly grocery shopping sessions I saw frozen falafels … I thought why not and took it, I was expecting visitors during the week. I figured I could fry these up when they come home. 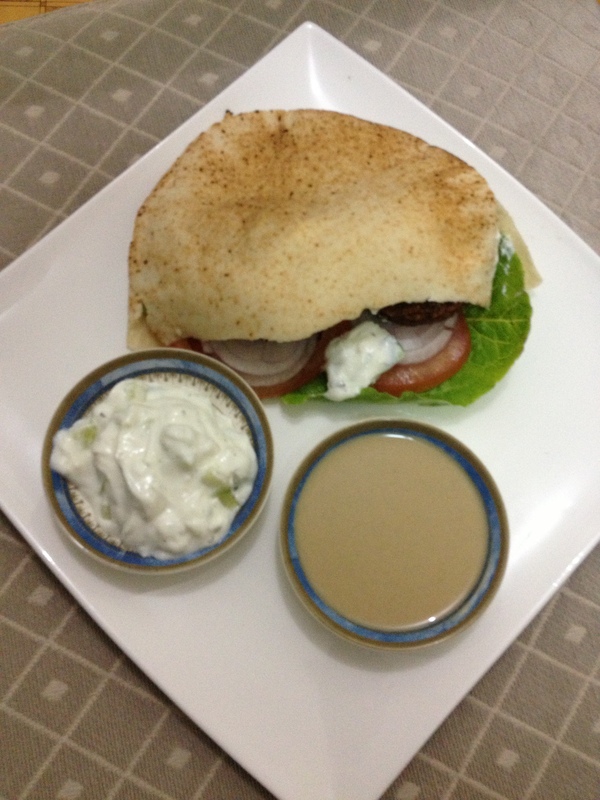 They came home, we had a great time, and I totally forgot about the falafels … typical Anisha huh …. Cut open the top of the pita bread to expose the pocket inside. 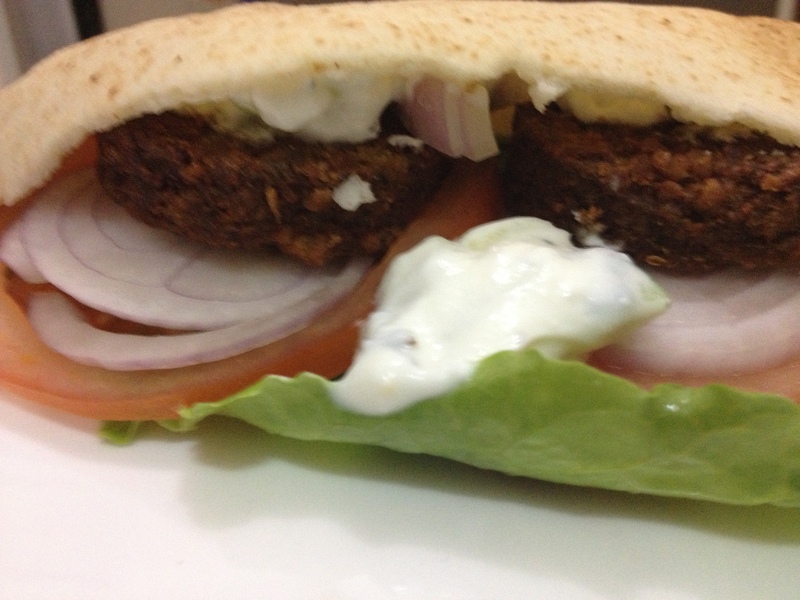 Layer the lettuce leaf, top with two tomato slices, then two onion slices, then a falafel on each onion – tomato slice, a tsp of tahini or tzatziki on top of each of the falafel and … eat it … how simple is simple. For further explanation look at the picture. I really hope you guys make this super easy, super tasty sandwich. That heart stopping moment when you just can’t find your photo library … awful, however after searching my computer I found my photo library so I can post this yummy Kadala curry. A quintessential Kerala breakfast is Puttu and Kadla. I doubt you can find too many Malyalee’s who dislike this combination. 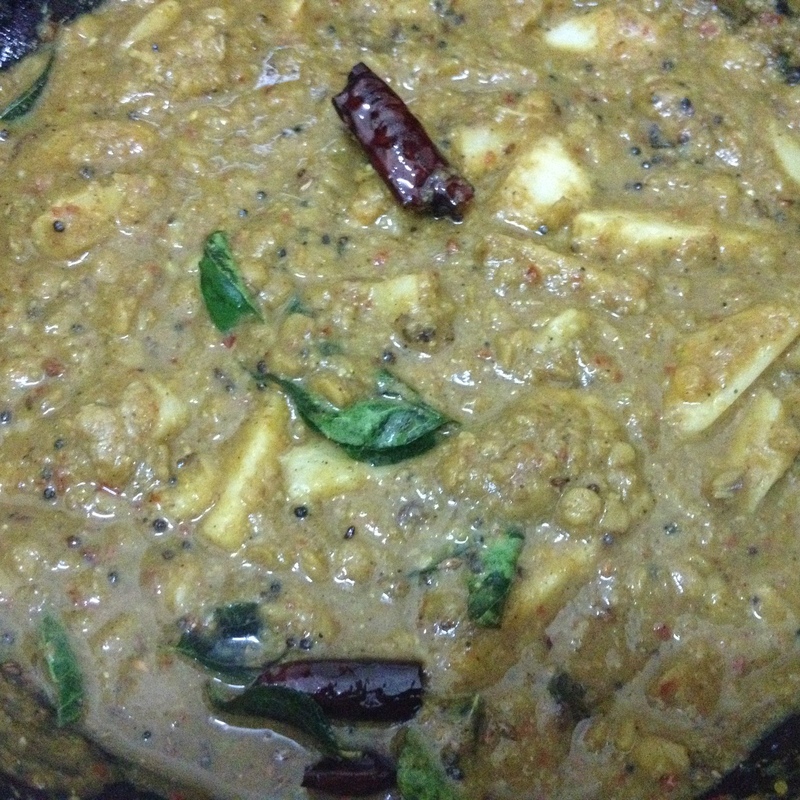 So here I am with an awesome recipe for Kadla curry from Flavours. The blogger and I share the same name … Anisha, that kinda predisposes me to liking her. 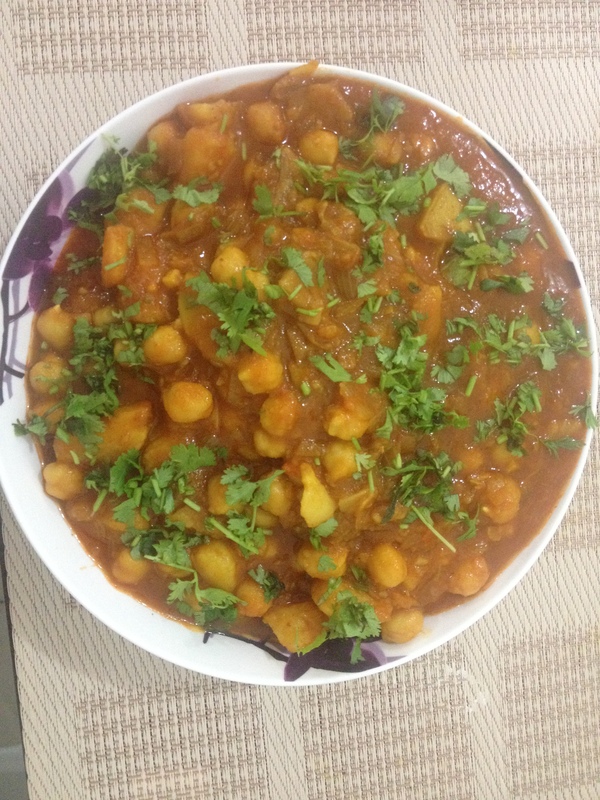 And then I tried her Kadala curry … it was the cherry on the icing … So here is Kadala curry from Anisha Ranjit through Anisha Kuruvilla for all of you lovelies out there. 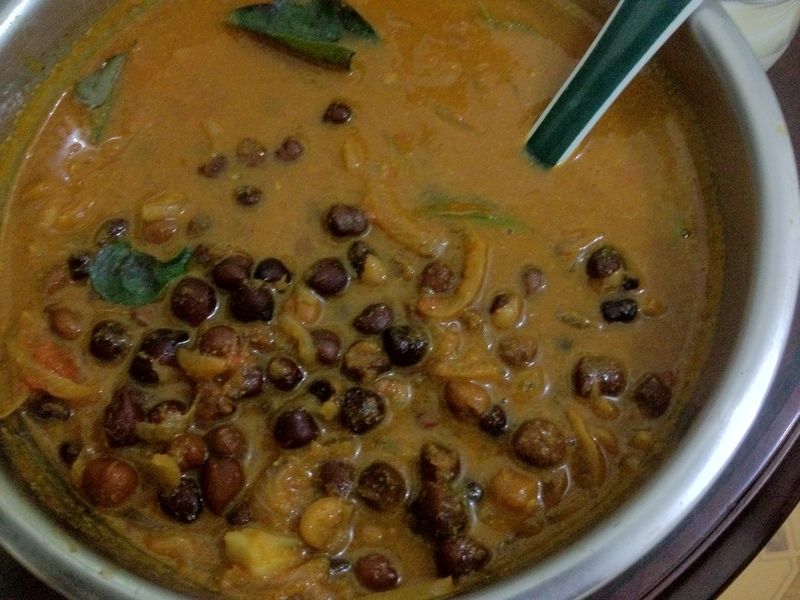 I know I already have a sambar recipe, and it is a good one … but here is a better one. Drumstick or Muringakka as it is called in malayalam is an old favourite in my house. The drumstick tree of full of benefits . You can read about the benefits all over the internet, so0 I am not going to repeat myself here. You can read it here, here, basically here. Getting back to my recipe here is how you make it. In a pan heat oil, add hing, green chillies,onions, curry leaves and sauté till pink. Add 2 cups water and let it come to a boil. Add the drumsticks, cover and cook till done. When the drumsticks are cooked add the cooked potatoes, salt, tamarind water and simmer. Add the sambar powder and stir it in. Check the dal for excess water, strain if you find anything, mash the dal and add to the vegetables. olet it come to a boil. Check salt, sourness and consistency. 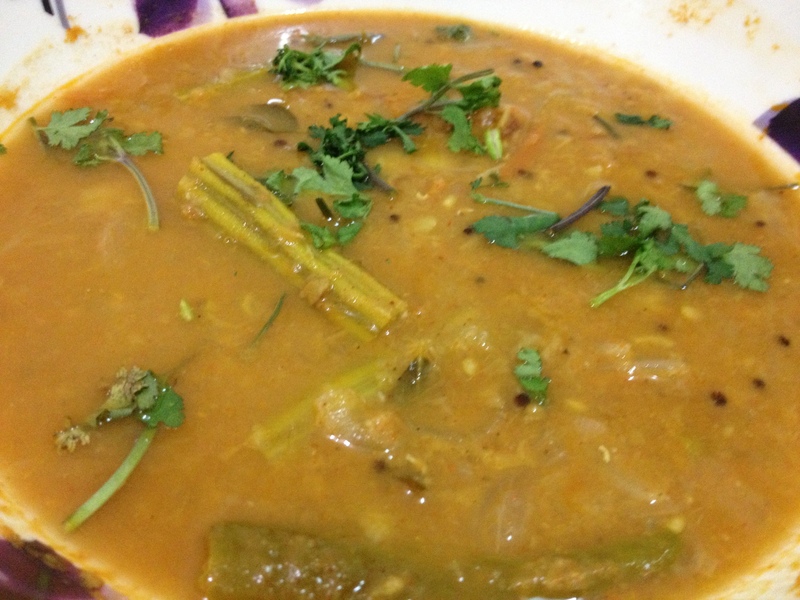 If sambar is to think add excess dal water. 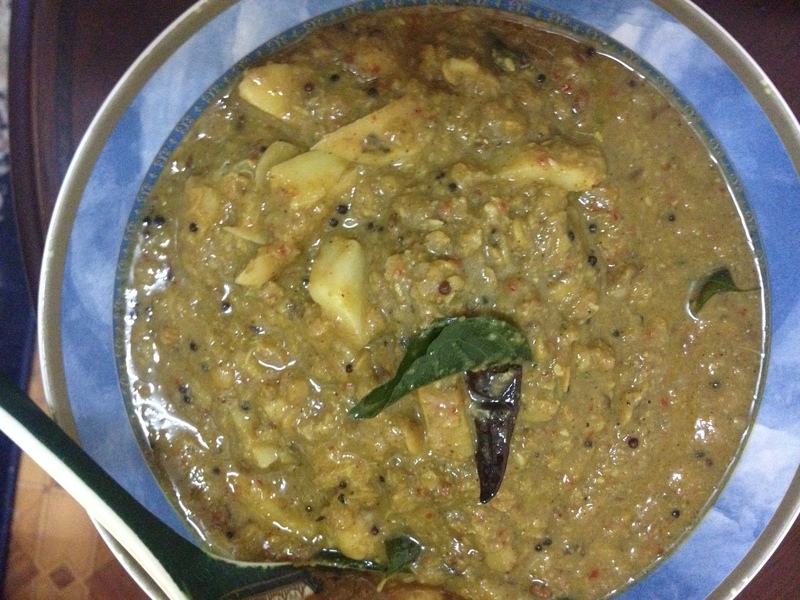 Do tadka with ghee and add it to the sambar. 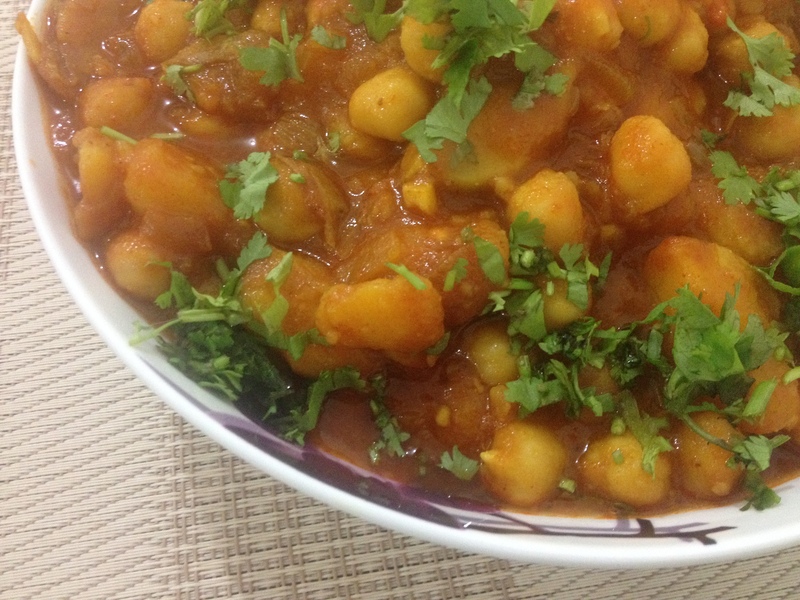 Today’s recipe is from the king of Indian cooking – Sanjeev Kapoor. Needless to say there is not much talking to do. I tried his Pindi Channa and loved it. It was a great side with chapathi. 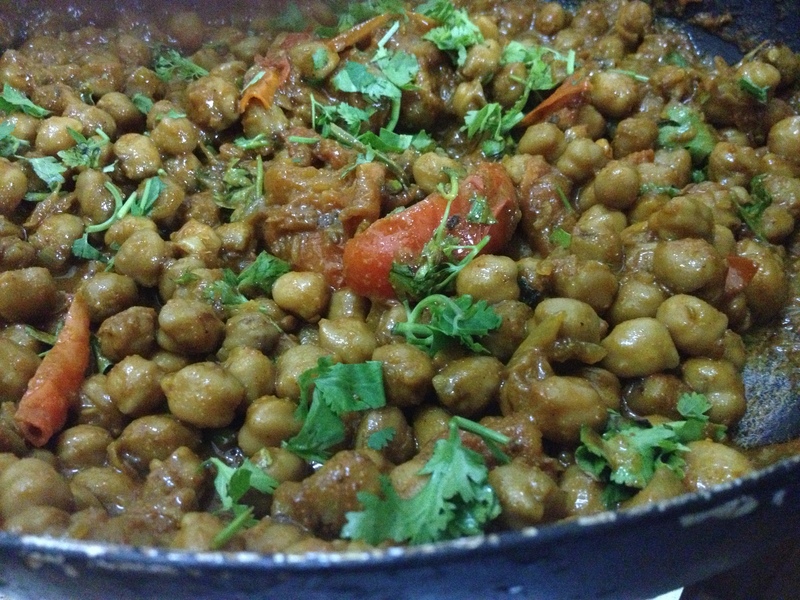 So here I am presenting Pindi channa from Rawalpindi district in Pakistan. I hope you will try it out and enjoy it as much as I did. 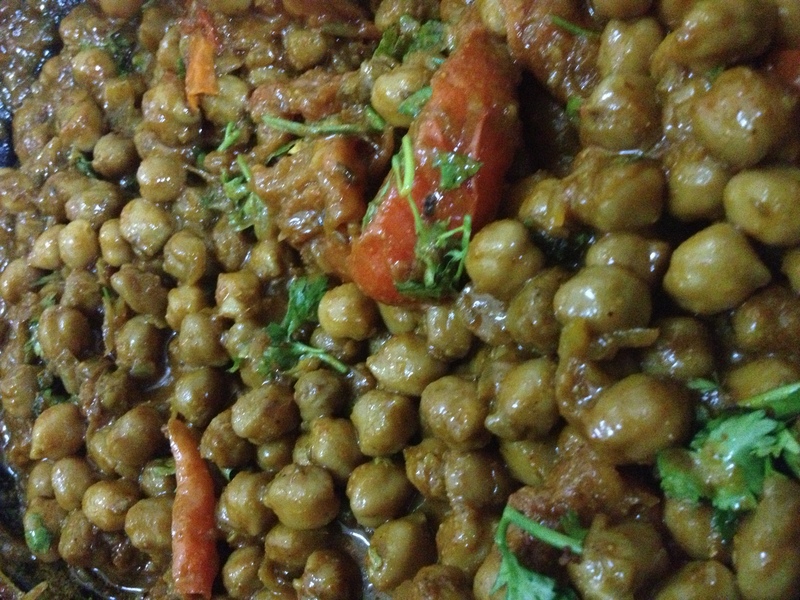 Here are a few images of what my pindi channa looked like.